Curiosity Shop was an educational television show produced for children that was created by famous Warner Bros. animator and director, Chuck Jones. It was aired on ABC. It was sponsored by the Kellogg's cereal company, and had many similarities to Public Broadcasting Service's Sesame Street, including live-action segments that included puppets, and animated segments. One segment even involved dolls. The program starred two boys and one girl, who would head down to the Curiosity Shop. It would be populated with puppets and cool gadgets. The children would learn various educational subjects, like nature, science, and history. Two animated characters were introduced by Chuck Jones. The first was named "Professor S.I. Trivia", a literal bookworm, who would be there to give the definition to a word the children didn't know. The second one was named "Monsieur Cou Cou", a bird with a French accent. He would always say "That's right!". He usually attempted to eat Professor Trivia with a nosedive, but the professor would always get out of the way just in time. Monsieur would then accidentally get his beak stuck in a book. Many famous/not-so-famous artists or animators would make contributions to the series, such as Irving Philips (creator of The Strange World of Mr. Mum), Johnny Hart (creator of The Wizard of Id), and Hank Ketcham (creator of Dennis the Menace). Henry Macini composed the theme song for the show. 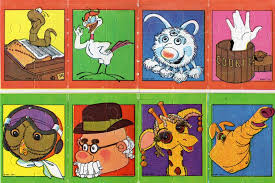 Some of the puppet characters included Flip, an orange hippo with gigantic shoes and a jive-talking voice, and Baron Balthazar, a small bearded little man who would tell stories about his antics in his homeland, in Downtown Bosnia. He was based on his character in a 1967 Yugoslavian animated series titled "Professor Balthazar". All of the puppets were created by Bob Baker. The show ran from 1971 to 1973, and began with an episode titled "The Curiosity Shop Special" on September 2nd, 1971. Every episode ran at an hour's length. Most of the series is unaccounted for, and even "The Curiosity Shop Special" doesn't seem to survive in its entirety, only surviving partially on a channel surfing video uploaded to YouTube in 2018, that starts about 19 minutes into the video and ends about 37 minutes into it. Due to ABC's wiping practices in the 1970s, it is unlikely more of the show will surface. What makes it even more unlikely is that the show ran before home recording machines like the VCR existed. Short clips of the show do exist, such as the intro and the before-mentioned doll segment, but other than that, not much else of the show has surfaced. A channel-surfing video, with a big chunk of The Curiosity Shop Special. A promo for the special. A VERY washed out recording of the intro.